Are looking for work in Higher Education? Our client is looking for an Administrative Assistant to join their team! Samantha strongly believes that people are a company's best resource. Recruiting at The Panther Group allows her to attract and place our clients best asset! 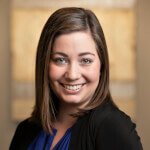 Samantha is an expert in many verticals and simplifies the delivery of top talent to each of our clients. Fun Fact: In Samantha's spare time she enjoys traveling internationally, and going spending time on local beaches in the summer!